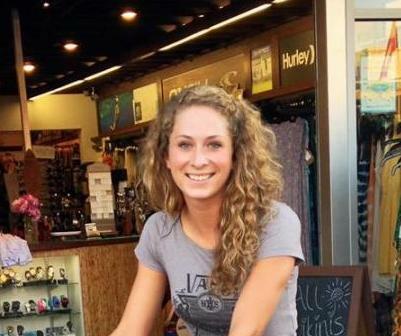 The victim in last weekend’s Ocean Beach hit and run is showing some signs of recovery, after suffering a severe head injury while ridding her bicycle late at night. Katie was on her bicyclist when it was hit by a white pick-up truck around 1:20 a.m. at the intersection of West Point Loma Avenue and Sunset Cliffs Blvd. The pickup truck had a camper shell and was northbound, and didn’t stop. Katie Connor, 23, an OBcean, is being treated at the University of California at San Diego Medical Center, where – and we quote from a website set up for her – “as of October 16, she has shown some signs of recovery after a portion of her skull was removed to permit her brain to better heal itself.” She had been placed into an induced coma, we understand. Connor had only recently moved to OB, had been living here for a couple of months, and is originally from Maryland. But Katie was ambitious apparently, she was holding down two jobs – one at Pizza Port and the other at South Coast Surf Shop, and had plans to participate in a 545-mile ride to raise funds to help battle AIDS. Her parents flew in and have set up a fundraising page in order to raise monies to help with her medical bills. As of this writing, they had raised over $13,000 towards their goal of $25,000. On Sunday, October 12, 2014, Katie was struck while riding her bike by a hit-and-run driver. She had only recently moved to California and was excited to soon be participating in a 545-mile ride to raise funds to help battle AIDS. Her injuries were severe, having suffered serious head trauma. She is being cared for by the superb team at the University of California at San Diego Medical Center. As of October 16, she has shown some signs of recovery after a portion of her skull was removed to permit her brain to better heal itself. I am hoping for your complete recovery. I have been riding for a couple of years and have recently stopped due to near death experiences on SD roads. I now stick to bike trails after work. All the best to you!! Must have missed something—in any case, I do hope for Katie’s complete recovery! I believe there is a fundraiser for Katie on Nov. 1st at OB Pizza Port. Her friends and co-workers are trying to help the family with all the medical expenses….